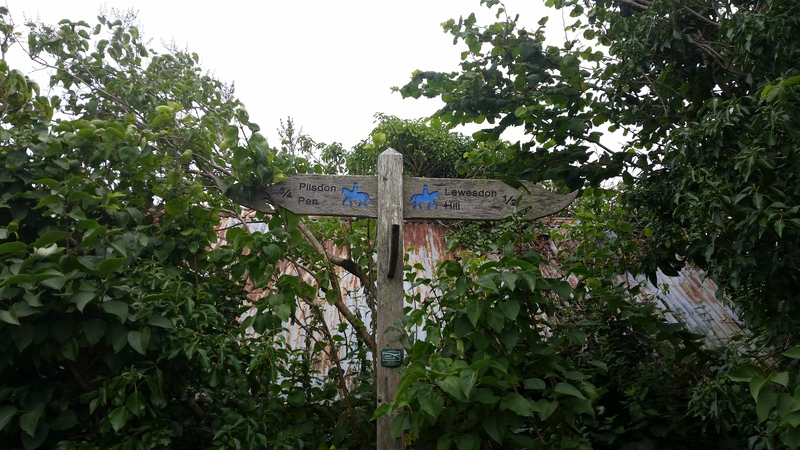 Todays trip was originally planned for Monday 10 August but the weather forecast was atrocious so stayed at home instead. 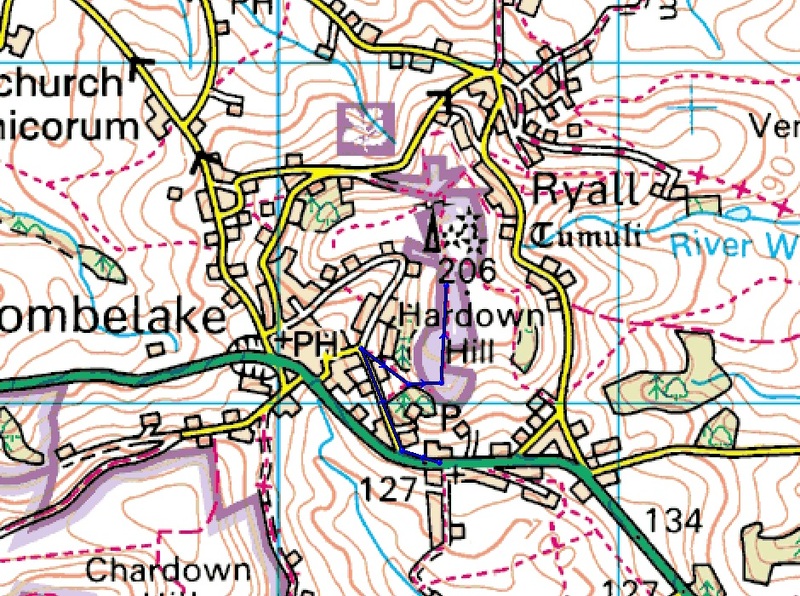 As is always the case with a unique hill for me I study the comments and reports of previous activations. My primary aim of these prelims is to ascertain possible parking places and routes. 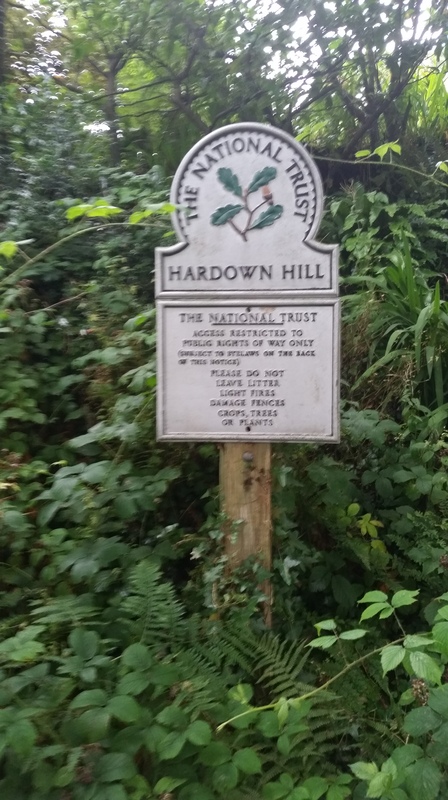 I was evident from the reports pertaining to Hardown Hill that parking was at a premium because of the narrow lanes that formed the villages around the base of the hill. 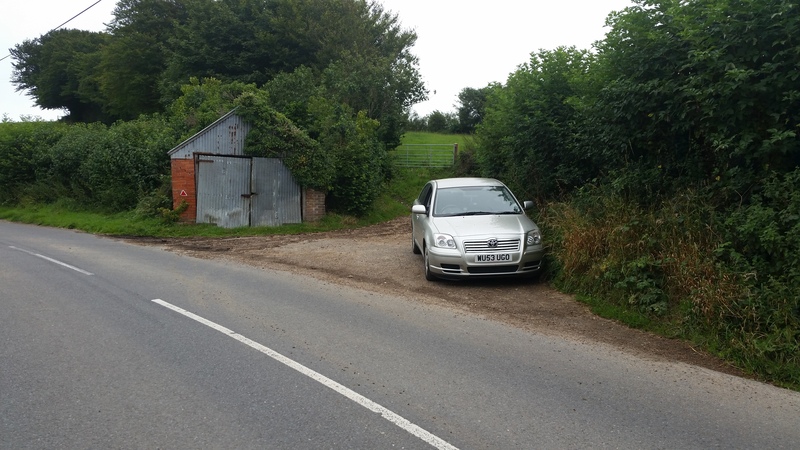 However, the ever faithful Google Maps showed a largish layby outside the Post Office on the main A35 through Morecombelake which was ideally placed for my preferred route SY 404938. From here take a short walk westwards along the A35 then head north up Gibb Lane to a sign-posted footpath on the right hand side. 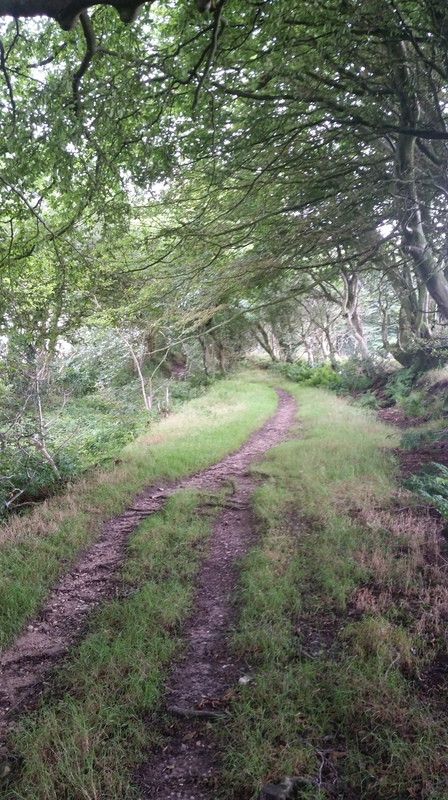 This path links in with the main bridal way to the top of the hill. About 100 metres short of the aerial mast is a small wooded area with a convenient bench seat ideal for setting up the sota pole. 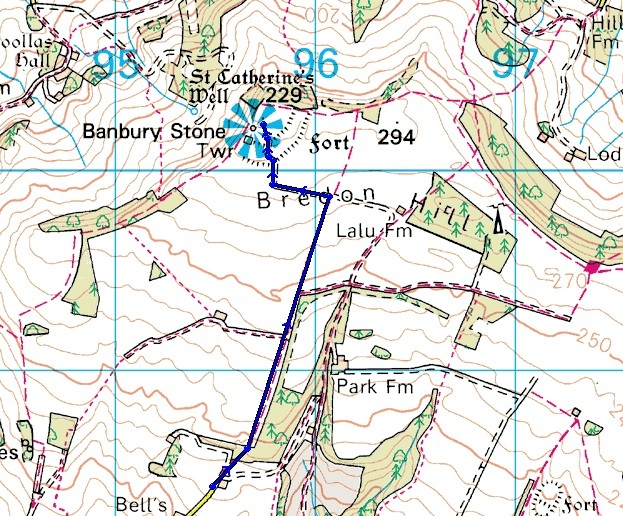 Distance travelled 0.62 miles, total ascent 263 feet time taken 12 minutes. Opening up on 60M resulted in 3 quick contacts but it took a move to 40M SSB to qualify the hill and even that only produced 2 further QSO’s. A switch to 40M CW netted a further 5 stations including a summit to summit with HB9BCB/P on HB/BE-085. The activation was concluded with a chat on 2M FM with G0HET just down the road in Charmouth. Again studying the previous activation comments highlighted an issue with parking, it also seemed that the preferred route was either from the east or the longer option from Broadwindsor. 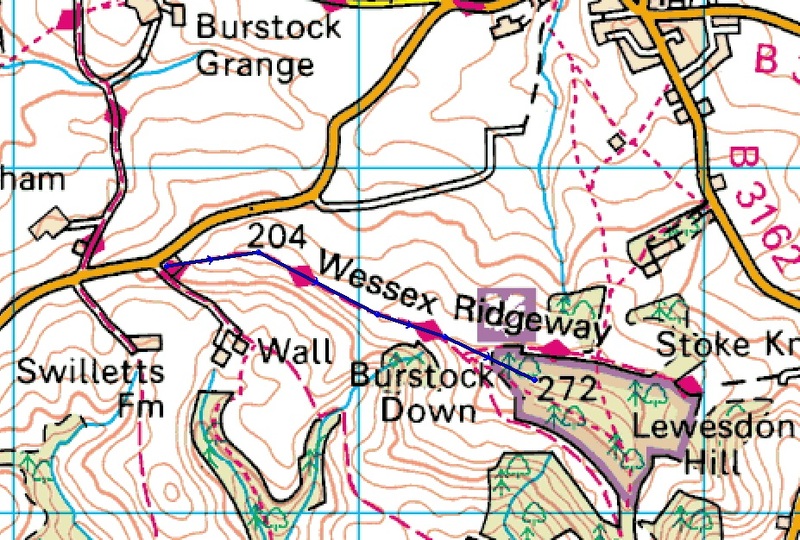 However, there is a good route up along the Wessex Ridgeway starting to the west of the hill at ST 424017. Google Maps also confirmed that at this point there is room to park at least 2 cars without blocking any access roads. 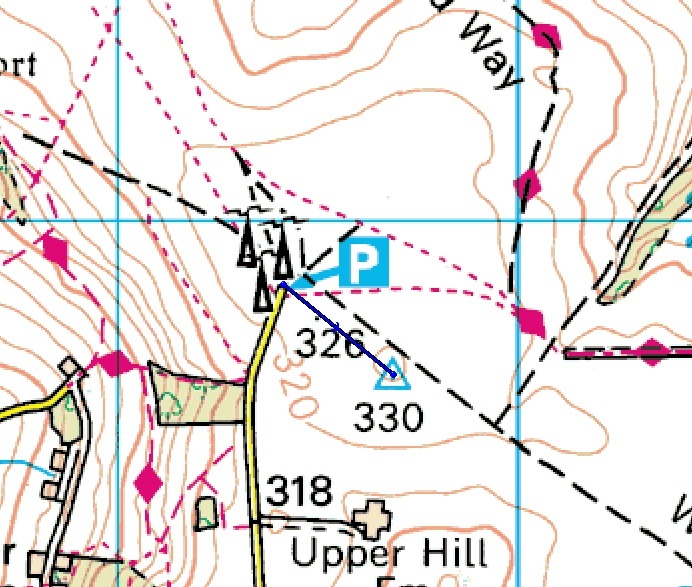 From the parking area there is an obvious sign posted footpath leading directly to the top of Lewesdon Hill. Once at the top a small clearing was located within the tree topped hill and the station set-up. Distance travelled 0.72 miles, total ascent 214 feet time taken 20 minutes. Whilst I was setting up for this activation I was trying to decide whether it was worth while closing the links for 60M as it had only produced 3 QSO’s this morning. Curiosity got the better of me and I opened up on 60M not expecting great things. How wrong could I have been to doubt 60M and how strange the propagation is at the moment for 8 stations were worked on 5.3715 MHz, just like the good old days! On a request via Don G0RQL from Jim EI9GBL I QSY’d to 5.4035 MHZ (a permissible QRG in EI-land) and worked Jim plus a further 2 stations. This morning 40M SSB had been poor and this was no different, except that it was now open to G-land rather than EU-land, but still only for 2 QSO’s. A change to 40M CW brought in the final 3 EU’s before it was silent again and time to go home. The track up to the summit. Tuesday 4 August 2015 Equipment FT-817 5 Watts, 4.2Ah LiFePO2, 60m/40m/20m linked dipole, 7m sotapole and a palm paddle, VX-170 plus RD. Bredon Hill G/CE-003 Arrived in good time at the layby at the end of the road leading up to Bredon Hill (SO 95487 38416) after a 2 hour 15 minute drive from home. 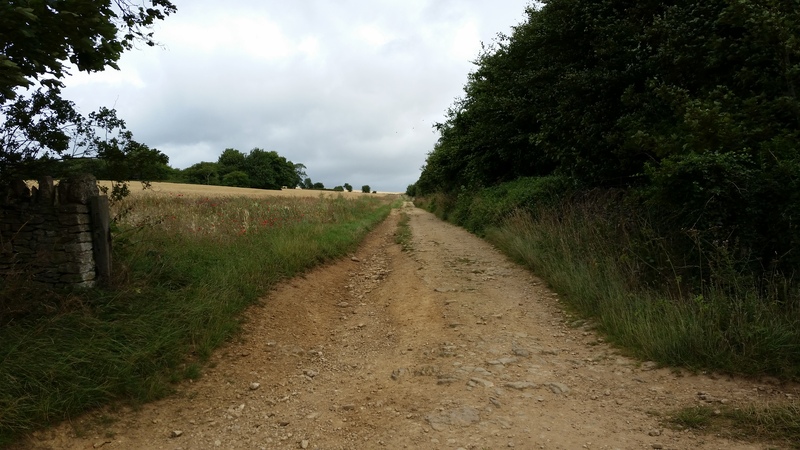 The path to the summit is a nice easy walk with a gradual climb along a Bridleway and Permissive Path. The weather for the day was forecast to be cloudy with occasional showers and windy, and it certainly was spot-on! Distance walked 1.4 miles, ascent 390 feet time taken 35 minutes. With the recent discussions about the poor propagation and the 60M band being the saviour at times it was decided to open on this band. An initial call on 3.3985 resulted in a QSO with G3VHH in Langley but no further calls. A self spot resulted in 3 more QSO’s with EI9GLB, G0RQL & G8ADD to qualify the Activation. A switch to 40M SSB brought in a further 6 QSO’s of which only 2 were in the UK – Ken GM0AXY in Edinburgh and Di G0EVV in Morpeth. A change to CW was poor with only 1 QSO. 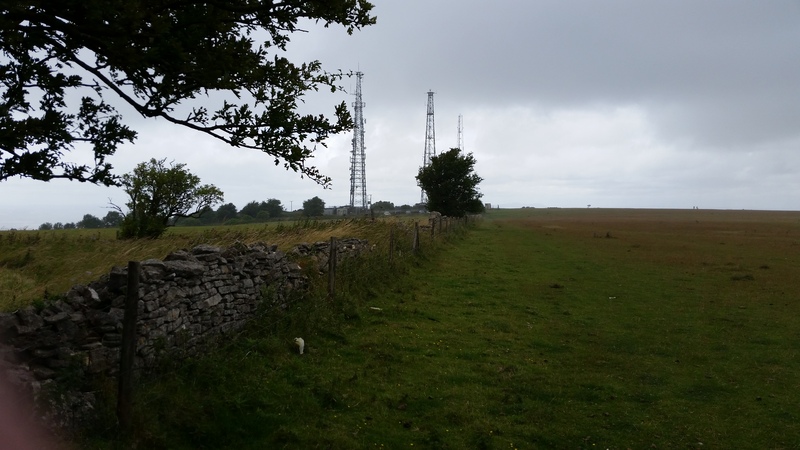 Having struggled to get 11 QSO’s in half an hour I decided to pull the plug and head off for Cleeve Hill G/CE-001. One day I will try to smile at the camera!!! Cleeve Hill G/CE-001 Following a quick coffee back at the car a 30 minute drive brought me to the summit car park of Cleeve Hill adjacent to the communication towers. With the weather looking a little unsettled I took a lunch break hoping the sun would return soon. 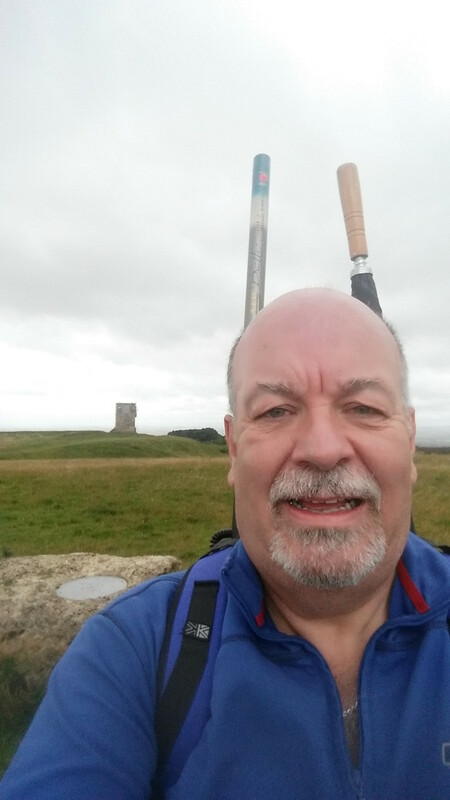 However, after 30 minutes and still no sign of the sunshine I headed off on the epic 300 metre trek to the trig point. Distance walked 300 metres, ascent 24 feet time taken 5 minutes – I stopped to shelter during a short rain shower. After this morning partial success on 60M I decided to follow the same MO. However, all though it was only 2 hours later the conditions had changed completely. 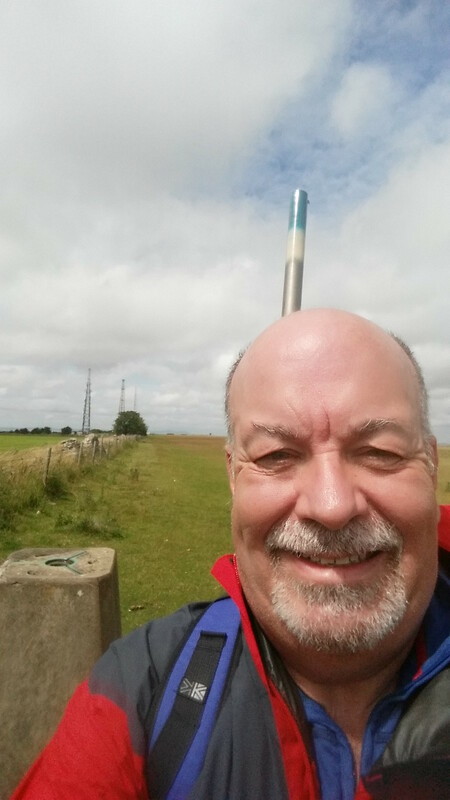 Despite self spotting and calling on the standard SOTA frequency there was total silence, a change to 40M SSB, self spot and call – nothing again. The first 30 minutes of the activation had resulted in no contacts at all – was I heading for my first failed activation? 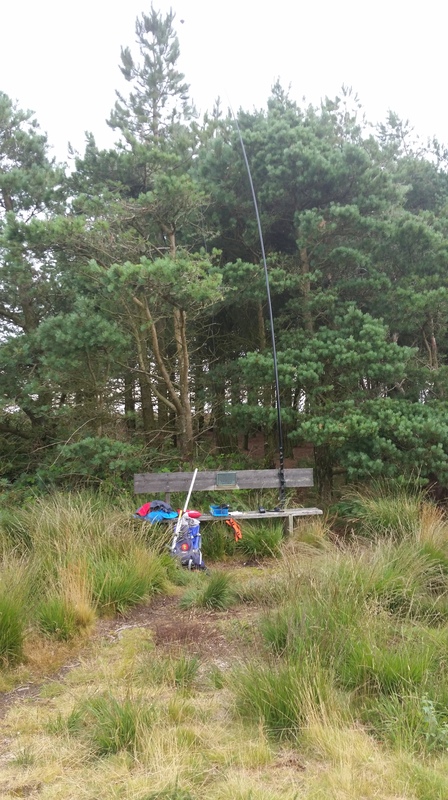 Switching to 40M CW and relying on KU6J for a spot, it was fingers crossed, metaphorically speaking, out with 3 calls – and nothing was the over whelming response. 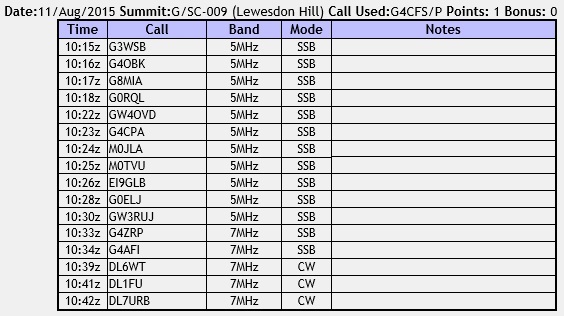 However, on the 4th call F6BWO responded with a 559 report so the band was opening up a little. This was followed by a further 6 QSOs including just a single UK station Ken GM0AXY for the second hill today. After the early struggle with SSB, CW finally came good and saved the day. Once the HF was all packed up a call on S20 (old school) got G3VKV in Cheltenham into the log. 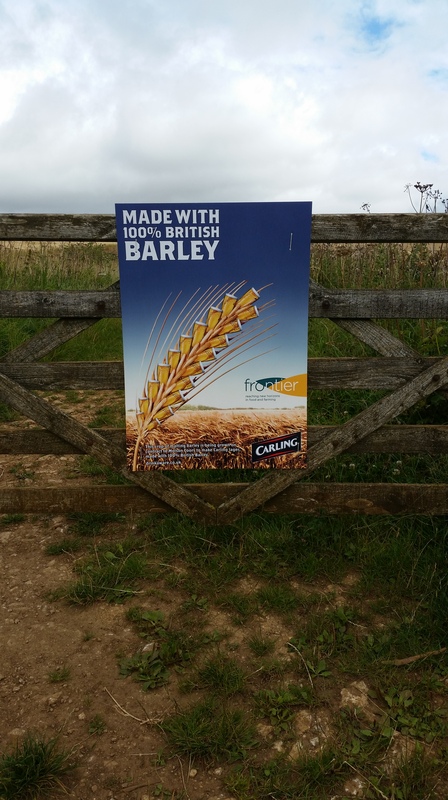 Not the best activation but a qualified activation at the end of the day. I thoroughly enjoyed both hill todays and would like to return when the sun is shining and the there is less wind – maybe next year. But for now it was the last of the flask of coffee and a pleasant 2 hour drive home. I finally managed to smile for a selfie!! !